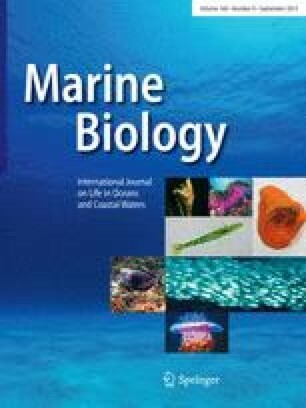 The role of trail following in the homing of intertidal chitons: A comparison between threeAcanthopleura spp. Three species of intertidal tropical chitons observed between 1984 and 1986, exhibit different movement patterns:Acanthopleura gemmata (Indian and Pacific Ocean) is a strict homer;A. granulata (Caribbean Sea) is mostly a ranger but sometimes shows homing behaviour;A. brevispinosa (Western Indian Ocean) alternates homing and ranging for different excursions. The three species have been studied in the field using a motographic technique to assess the importance of intra-individual trail following in homing. The fraction of the path which overlaps with earlier segments of an individual's trail is different in the three species: when returning from feeding groundsA. gemmata follows almost the whole of the outgoing path; inA. granulata the path coincidence is minimal, whileA. brevispinosa shows intermediate trail following values. InA. gemmata andA. brevispinosa trail overlap rises rapidly just after feeding, and trail following is mostly backward along the outgoing path. On the other hand,A. granulata shows a linear increase in trail coincidence with increasing path covered and the proportion of forward trail following is relatively higher. Nevertheless, all specimens of the three species which show a high homing performance invariably show a large trail following also. These findings confirm that, despite the interspecific difference in ecology and the related variation in spatial organization of foraging excursions, trail following is the basic mechanism for homing in intertidal chitons.